Following on from Sunday's post where I revealed I had heard a rumour of Go Ahead having an interest in Coach Services, I have been contacted by Rob from Coach Services saying that there were a few open mouths at Thetford this morning as this was the first they had heard of it. I emphasised on Sunday it was only a rumour, and I'm actually relieved to learn it was just a rumour. So don't panic (where has that been heard in Thetford before) passengers and staff of Coach Services it appears to be business as usual and my apologies for the multiple heart attacks this morning! Many thanks, Rob, for getting in touch so soon and the kind words about the blog. It is sometime since I had a rant, but this week has sent my blood boiling on more than one issue, and I don't see why I should keep this to myself, so here goes. I try to stay out of politics on this blog unless it is relevant. Council cuts to transport are relevant. When I interviewed the Labour candidate on his transport policies that was relevant, but I'm going to deviate into national politics for once, and you can probably guess where this is leading. I have been a rail commuter, having to stand on packed trains. I have guarded commuter trains that even with 12 coaches were so full we didn't even take a ticket machine with us as the thought of getting through the train to check them was laughable. So when someone tries to highlight the issue of overcrowding on trains I'm going to back them all the way. Except it has backfired spectacularly. Jeremy Corbyn is an intelligent, principled man. Like him or not go through his career and his views haven't wavered. You won't see him tearing into someone saying he would never share a stage with them because of their extremist views then weeks later sharing a stage with them. You may not see him every day spouting the usual rhetoric into any camera pointing vaguely in his direction just to get him on the evening news bulletins, but he knows what he believes. A lot of people have had trouble understanding that which is why instead of getting stuck into the Government Jeremy Corbyn is having to fight for his job again. And it would seem he has his entire party against him, even his own advisors. Very few people would have advised Corbyn that the ideal train to highlight overcrowding on was the 1110 out of Kings Cross. There just aren't any overcrowded trains at 1110. Anywhere. I assume his schedule was so tight they couldn't afford to wait for the 1710 which would have been more rammed than a field of ewes in November. However, once on the train and wanting to highlight the issue of the turn up and go passenger paying the highest fares and yet having the least chance of a seat it had to be done. So having walked thought the entire train and realising that it wasn't overcrowded a bit of acting was called for. Only the script was awful. Had he said straight away that on that particular train there were seats but many hundreds if not thousands of people a day couldn't travel late morning and so had to sit in corridors, stand for hours etc, and what he was going to do about it then no one could have said a thing and the issue would have been highlighted. But he didn't, and Virgin rightly had to defend themselves saying that on that service there WERE seats available. Now Corbyn is being accused of dishonesty, deceiving the public and has become a bit of a laughing stock. For anyone to single Corbyn out as dishonest amongst politicians is laughable. As misleading the public goes what Corbyn did on that train was so minor compared to what others IN office have done in recent years that it's on a nano scale. Trains ARE overcrowded. Turn up and go fares ARE too high, as are branch line fares you can't buy in advance. Who else is highlighting it? Corbyn could have done what any other politician would have done - booked 1st Class in advance and ignored what was going on that affected the ordinary traveller. But no, he travelled Std Class without advance booking in an effort to highlight an issue. Yes the execution was bad, but for heaven's sake in the grand scale of things it was hardly life changing. Please carry on highlighting high fares and overcrowding Jeremy, because I can't see anyone else doing it, especially those who have been laughing at you this week. Trainspotting Live, another well intentioned but badly executed project, said one of it's main aims was to dispel the reputation that trainspotters have got for being boring, humourless pedantic nerds who take things far, far too seriously. Over recent weeks I have realised that aim was as futile as King Canute trying to turn back the tide. When I started this blog I said one of the things I disliked about the enthusiast community was the lack of humour. I even got a t-shirt printed with the legend "Bus & Trainspotters do it in anoraks" because I knew 80% wouldn't get it. I was right. So let's examine how so called enthusiasts have covered themselves in glory this year. The Flying Scrapheap sorry Scotsman never came to East Anglia thanks to enthusiasts trespassing on the line, something that has dogged the FS all year despite appeal after appeal. Enthusiasts sending deliberately misleading tweets into Trainspotting Live which made everyone look an idiot (Pendolinos spotted in Wick etc). Window hangers blocking exits and ventilation on the short sets and all heritage line trains setting a great example to kids. Bus photographers not respecting the driver's right to privacy and refusing to take pics from the right angle so driver cannot be identified. I can now add to that list. The internet has been a Godsend for the enthusiast. Information on incidents, rare workings, specials etc can be passed at lightning speed, photos shared (but copy one and it's regarded the same as armed robbery), live diagrams available, dare I say entertaining transport blogs and so on. However it has done something else which is proving not so positive - it has brought enthusiasts together in what is essentially a hobby as solitary as fishing. There are two types of enthusiast. Those who use public transport or work in it and so have an interest in it, or those who are only interested in photos and numbers, regarding the everyday traveller as an inconvenience getting in the way. The two are as different as chalk and cheese. The former will have other interests, a sense of humour, and won't regard a wrong digit in a number as a mortal sin. The latter take everything so seriously you'd think Italian earthquakes or wars in the Middle East didn't exist - numbers are everything, passenger trains are a necessary evil holding up freight trains, got a pic of that Pink Streetdeck but will never travel on one in their life and so on. The two do not mix well. I have left a Yahoo group giving rail information in East Anglia because of the dictatorial manner it is run - anything not strictly on topic - even comments about on topic events - are dismissed and the writer belittled. And now the same has happened to Railcam. I have given a lot of free publicity to that site, got involved, even written a few quizes for them - don't get me wrong the cameras, most of them, are great, and the live diagrams invaluable, but in the chat room you have a mix of those who like to talk about things other than trains, and those who want to talk about nothing but trains, and which Class 66 is currently passing through Slough. So the ones without humour complain about those such as myself who have one, and unfortunately the site management have sided with those complaining. What is meant to be an adult chat room is controlled like a nursery school, and as such I won't be publicising or doing anything for the site in the future. It's a bit like going to a pub and only being allowed to talk about alcohol whilst not being able to use expletives more extreme than "golly" or "gosh". Talk about footy and you;re barred! It's still a great site for watching trains or better still to see how the network is running if travelling yourself, but don't go there for a social life - not unless life for you begins and ends with Class 66 locos. It's much better as a solitary hobby. A couple of nuggets from the rumour mill this week. Firstly, and rather intriguing, are rumours that Go Ahead, that bastion of good business running, is sniffing around Coach Services, the Thetford based bus and coach operator. Nothing has been confirmed yet, and I would be amazed if Go Ahead wanted to expand their East Anglian operation after the disaster that is Go East, and even more amazed if Coach Services were daft enough to want to sell their excellent operations to them so watch this space. Secondly I have been told that the gas buses will be heading to Plymouth around 24/25th of October. I believe that to be half term so would make sense, although later than first suggested. Again we are talking Go Ahead so only believe that when it happens. On the subject of Anglian I bet First are quaking in their boots at Anglian's latest assault on them. Staff at Anglian were told at a recent meeting that Anglian were "really going to go after First", Lord knows how with a fleet of 18 after the gas buses go, and so the 71 from Yarnouth to Belton is to be launched, replacing the lack of a daytime 7 along Beccles Rd in Bradwell. An hourly service involving one bus so let's hope Southtown Rd is clear. I also doubt First YarLow tickets will be accepted so that rules out coming home later. Perhaps they think through passengers for Norwich will be happy to change at Yarmouth instead of staying on the X11 right through. Oh well they must have done their research. Funniest thing is they said the route has been launched due to "requests from the public and LOCAL STAKEHOLDERS". Since when have stakeholders in a bus company EVER travelled by bus! I reserve judgement but you'll all know what I'm thinking. Soapbox away - have a good week everyone, and if on a short set don't block the bloody ventilation by window hanging! I have been wanting to do what I did yesterday for a few weeks now - ever since Greater Anglia hired in another Short Set, this time with Class 68's. It has made our little area rather uunique. There are places in the country where you can get on a train hauled by a 68 - both Chiltern Rail and Scotrail use them. 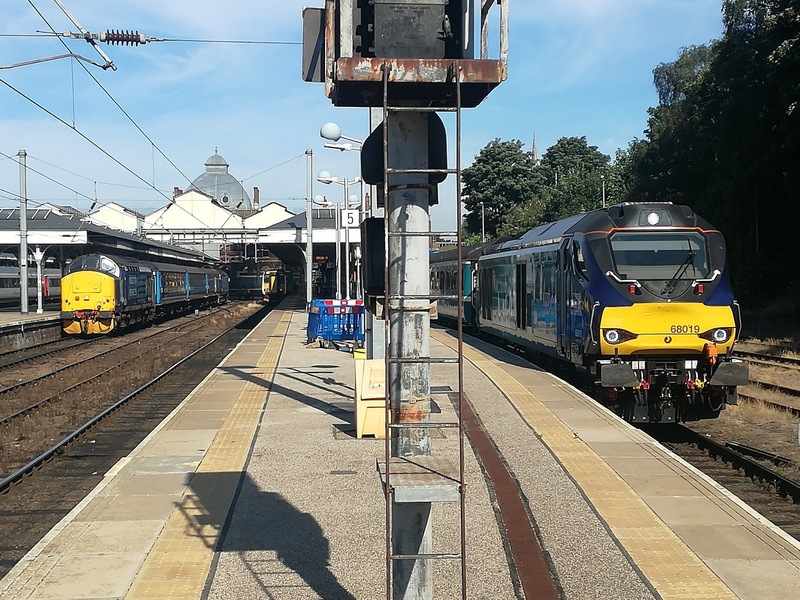 Northern Rail have a couple of 37 hauled trains running between Carlisle, barrow and Lancaster. However none of them are top and tailed, and there is nowhere in the country you can hop from one onto the other. It's like having a daily Diesel Gala on proper tracks doing proper speeds, not a hair pulling frustrating 25, and a lot cheaper than heritage lines too. My £9 Wherry Lines Ranger ticket enabled me unlimited travel on the lines between Norwich and Great Yarmouth/Lowestoft and with a bit of forward planning I took full advantage of it. I started off by driving to Acle station, where at 0859 precisely the two sets meet. The meeting is guaranteed as Acle is a passing place, and so I set up shop and waited. First to arrive were the new kids on the block. 68016 pulling 68019 en route from Yarmouth. Shortly the daddies arrived from Norwich, 37019 with 37405. Nowhere else in the country is this view possible on a daily basis on National Rail lines. And here is the video that pic is taken from. Volume to 11 again! I waited half hour for the 37's to return and caught them to Norwich. Sitting near the front the sound is just incredible. 37405 was thrashing away and I felt a real sense of exhilaration. On arrival at Norwich I had a few minutes to get some pretty unique pics. 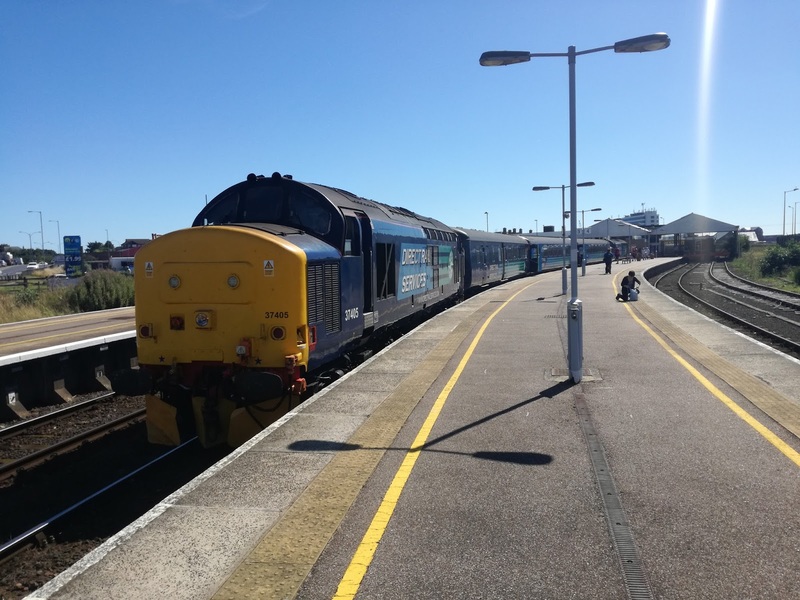 I jumped on the 1005 to Lowestoft and sampled my first experience of 68 power. My word the aeceleration is impressive - these 68's possess raw power and although the soundtrack isn't as in your ears dramatic as the 37's there is still a very satisfying growl and rumble from them, as you'll hear later. A cracking, if somewhat hot journey to Lowestoft and back with very limited time for photo opportunities as volume of passengers affected timekeeping. I did manage to get one though, a 68 next to a 170. Normally after arriving back at Norwich on the 1057 from Lowestoft the 68's take a break, but recently they have also operated the 1205 and 1405 to Lowestoft which gave me an idea. It was becoming obvious it was going to be far too hot to ride on these trains all day, especially as the limited ventilation was further obstructed by idiotic so called enthusiasts hanging out the windows, thus blocking the air coming in. Such selfish behaviour does the reputation of enthusiasts no good whatsoever and is an embarrassment. Anyway I had to get back to Acle so caught the 1236 to Yarmouth, with 37419 sounding even better than 37405 did earlier. This time there was time at Yarmouth for some pics. It suddenly struck me that if a certain brewer of beer did railway theme parks it really couldn't get much better than this. The best rides, soundtracks, sights, and all for under a tenner. 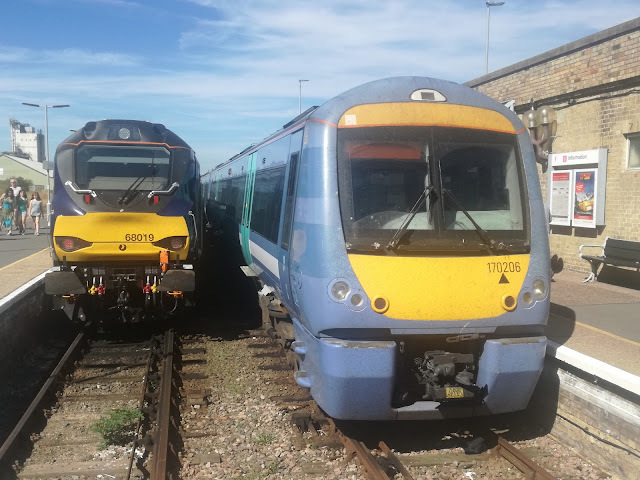 Since the heat had put pay to anymore riding the fact that the 68's were doing the 1405 to Lowestoft meant that consecutive trains would be the 2 short sets. I thought it might be quite good to get them on video at Oulton Broad North, going across the level crossing, so a pleasant drive from Acle later and I was in position to catch the sets going both ways. First up were the 68's. I love the next pic with the brand new locos passing the semaphore signal - a mix of 2 eras. 20 mins later and 68016 was back, and this time I was by the crossing to hear her pass at full power. And here are the videos from which the above pics were taken. 30 mins later and history repeated itself. This time with the 37's, and as you will see from the next pic it's only the liveries that mean you can tell the pic was taken yesterday, not 45 years ago. It's truly amazing these old girls are still going so strong. 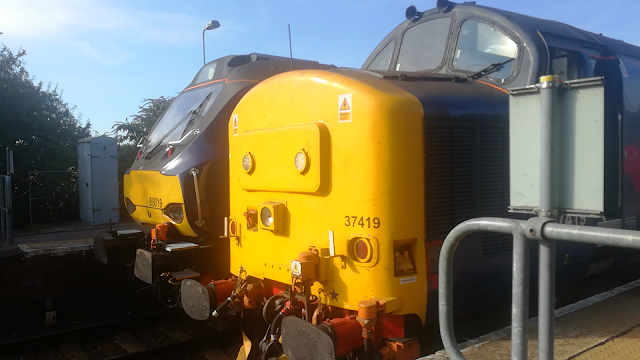 Two more vids for you delectation, this time the 37's both thrashing away. And that was that - one of the most enjoyable days I can remember for ages. The 37's will be hanging around for sometime, but I don't know about the 68's as they were only meant to be here till September. However with Greater Anglia winning the new franchise I hope their stay is extended too. 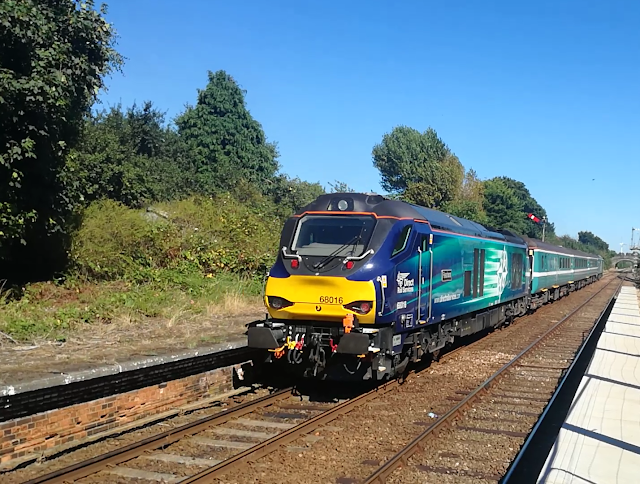 One thing I;d love to know is how much extra revenue these loco hauled services are bringing in from enthusiasts, the huge majority of whom sit down btw. Every time I've seen or been on one of the Short Sets there has been a load of passengers who are only travelling because of the locos involved. It would be nice if they were paying for themselves which could persuade GA to keep their live museum rolling. Don't miss the opportunity to ride and see these trans for yourselves - it really is a unique experience not available anywhere else..
My apologies for lack of posts over the last few days - this being mobile again is taking some getting used to. In fact I've clocked up close to a thousand miles this week with a hospital visit in West Sussex and taking a friend up to Cleethorpes on Friday, together with general buzzing around all over Suffolk, which I'm only just realising is so vast and spread out. "Nipping" from Beccles to Woodbridge, as I did on Wednesday would have taken at least 3 days planning for the equivalent journey down in Kent! However, I have not been idle, and have managed to fit in a few things to post about as well, so here goes. Tuesday saw my little Fiat brave the journey to West Sussex for my latest appointment at the eye hospital. The journey went so well I had time to pop in somewhere I have been meaning to for quite some time now, but have never quite got round to. 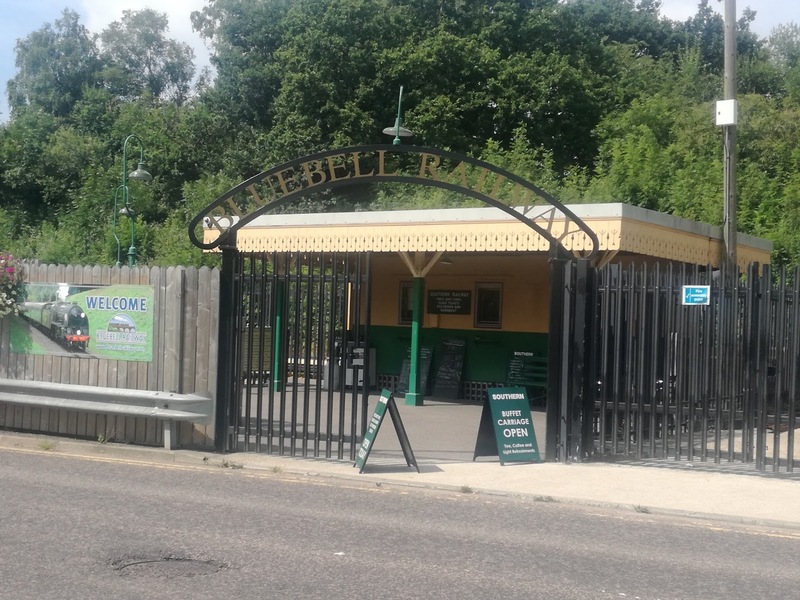 In 2013 the Bluebell Railway re-opened its station at East Grinstead to provide an easy link from Southern's terminus station and also to allow much easier access for visiting locos. While I was there I was lucky enough to see one of Bluebell's eye catching steam locomotives. Camelot is a preserved BR Standard Class 5 4-6-0, originally built in 1955, working on Southern Region, then withdrawn in 1966. After languishing at Barry docks for 10 years she was purchased by the 73082 Camelot Locomotive Society and moved to the Bluebell Railway. Returning to service in 1995 Camelot worked on the Bluebell Railway until 2005 when she was withdrawn for a 10 year overhaul. 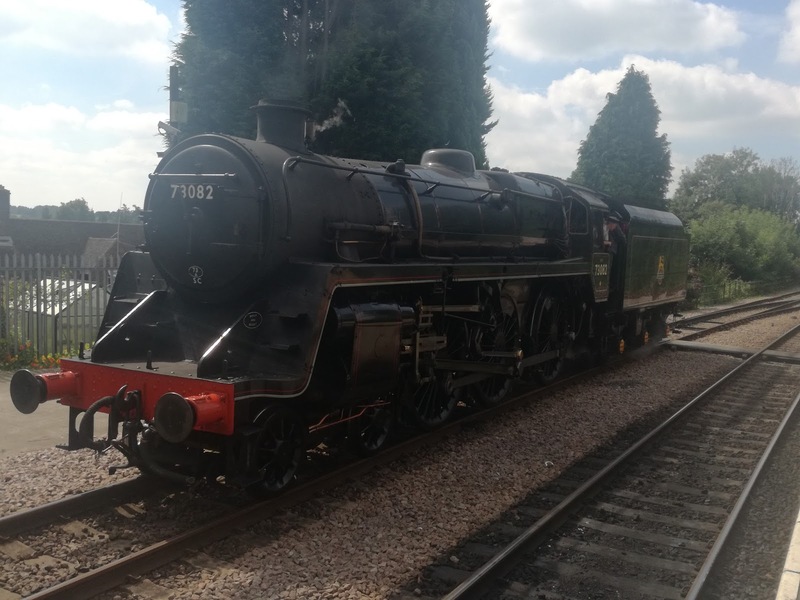 Returning once again to service last year she looks rather impressive, and that's coming from a self certified non steam enthusiast! Now a little teaser for you. 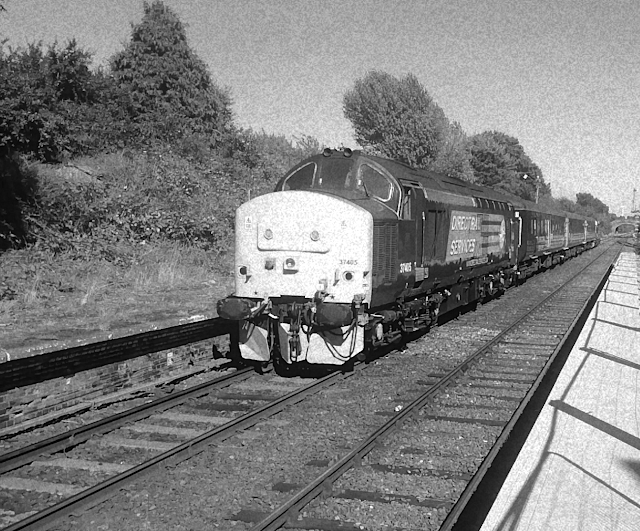 If you were to be transported back to Kent in 1980 what did all these places have in common? Borough Green, Maidstone, Hawkhurst, Tenterden, Sittingbourne, Sheerness, Tonbridge, Tunbridge Wells, Edenbridge, Luton (Chatham) and Gillingham? Answer - they all had bus depots operated by Maidstone & District. 36 years later only Gillingham, Maidstone, Sheerness and Tunbridge Wells remain, and now it has been announced that Tunbridge Wells is soon to close too. So after a very positive hospital visit I took the opportunity to drive home via Tunbridge Wells to take what could be my last pictures of a depot I will remember with fondness, as Tunbridge Wells was one of my old stamping grounds as a teen, and I travelled on a lot of the TW fleet regularly. Now under Arriva management it still looks the same as it did all those years ago. The town won't be the same without it. Thursday was a frustrating day. The majority of it spent watching the car have a new rear bush fitted, which sounds simple but took the best part of 9 hours. As such I was unable to get to Norwich to see Network Rail's observation coach "Caroline" with BR liveried 37401. Extremely frustrating, but this frustration was somewhat tempered later in the evening when another test train, topped and tailed by two more 37's took a trip up and down the East Suffolk line. This is where being mobile again comes into its own, as I worked out where the location for the best "clag" would be, and so ended up at Darsham station, and took the following video of 37608 and 37611. Headphones on and volume to 11. I have a few things planned this week so hopefully it won't be as long before the next post. Enjoy the sun. And so it came to pass that the Lord (Department of Transport) looked down on Abellio and spake "verily thou art doing a great job with no delays, short forms or cancellations. I thereby do entrust thee to carry on thy labours for a further 9 years". 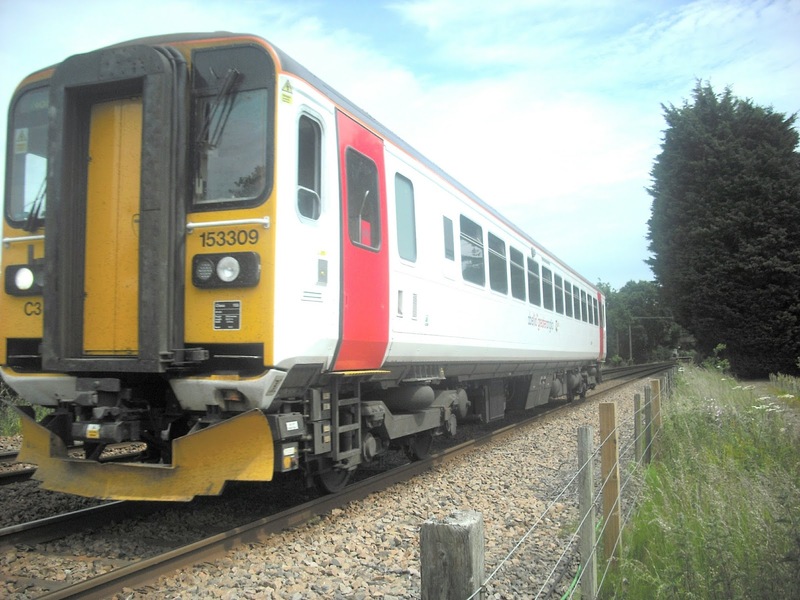 Yup it was confirmed today that Dutch operators Abellio have won the Anglia franchise and will continue to operate rail services in East Anglia for the next 9 years. In return Abellio haven't just promised the Earth, but a fair chunk of Mars and Venus too. This is the list of pledges that happy Anglian passengers can expect. Now I have been accused of being cynical in the past and I am trying my hardest to refrain from looking at these pledges in a cynical manner. I'm failing. Replacing the ENTIRE fleet within 4 years? Why? What is wrong with the 360's or 170's and indeed the very new 379's? Why do they need replacing? Granted everything else does and if we get shiny new rolling stock that can only be a good thing. The optimum operational performance target should always be 100% as it is in Japan. Accepting that 7 in every 100 trains are going to be late just isn't good enough. More capacity is always welcome but hang on - we are told the network is at maximum use, so how on earth are another 1,144 services going to be squeezed in? Skipping down a bit the IC sets already have Wi-fi so why not make it free now? Go on AGA I dare you! Now let's look what AGA are proposing for specific lines. Two of those points shout out to me. Firstly through services are to be restored between London and Lowestoft, only 2 a day each way mind you, so we can only hope that off peak travellers will benefit too. Secondly the Sudbury branch extending to/from Colchester is long overdue, and means passengers on that branch can connect with fast services to London at Colchester. Pretty self explanatory - I presume the stopping services currently terminating at Ipswich will be extended to Norwich as there simply isn't the space for an extra fast service an hour. Good news that the Ipswich - Peterborough service has been not only saved but enhanced and extended to Colchester. Direct services from Norwich to Stanstead are long overdue too and a welcome addition. Just make sure the EMT service to Liverpool continues to start at Norwich. Good to see extra trains soon the Yarmouth line and later trains are always welcome although I confess to being disappointed that there isn't a later train on the East Suffolk Line, as having to leave London by 2100 at the latest in order to make the last connection isn't good enough. Now what about these brilliant new trains. Well it would appear that Derby based Bombardier will build a lot of them, although the models and specifications have not been announced yet. However Nigel Harris, editor of Rail Magazine has suggested that 600 vehicles could be bi-mode trains built by Swiss company Stadler. That will be a first for the UK if so. So everything is rosy - a magic wand will be waved and the good people of East Anglia will at a stroke have a space age railway everyone has been dreaming of for decades. New trains, extra services, free wi-fi, excellent station facilities, easy to understand ticketing. Yeah ok guys. If you are stuck in a traffic jam it makes no difference if you are sitting in a Rolls Royce or Reliant Robin, you are still stuck and not moving. 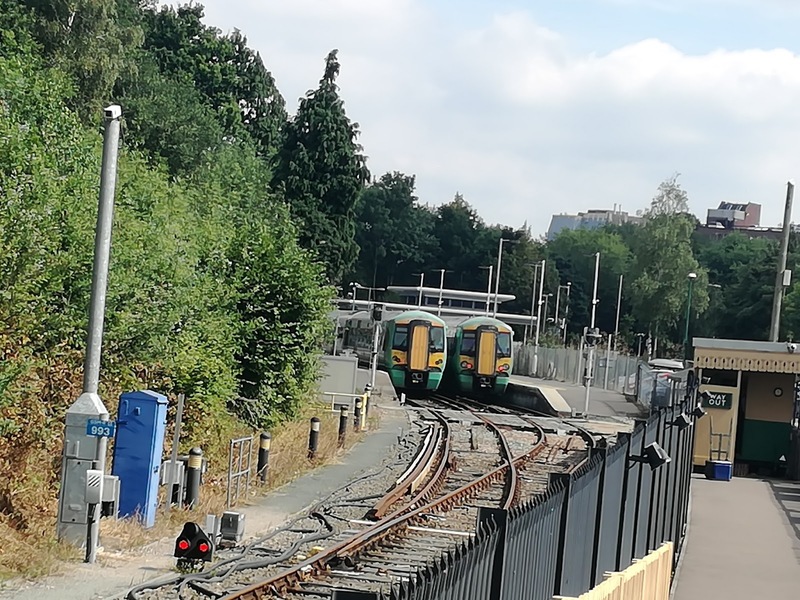 Yes we can have new trains and more services but what cannot be overlooked is that they will be using the same infrastructure that is responsible for the majority of delays. There will still be the regular points and signal failures, the same leaves on the line, the same suicides, and above all the same if not more number of freight trains breaking down or delaying passenger services which will cause even more knock on effects with extra services involved. I have seen nothing from Network Rail saying what they will do to improve the performance of their own infrastrucuture. For 18 months now midweek evening services from London have been disrupted because of the ballast cleaning going on, that has achieved absolutely nothing from what I can see. I have seen no announcement promising extra penalties for freight operators delaying passenger services and nothing from the freight operators saying what they are doing to replace unreliable locos. So I hope you will excuse me if I regard this announcement in the same way I look at a victory speech from an election winning politician. A couple of months after the promises are made the excuses start trundling out. I'll believe it when I see it - but I repeat my challenge to Abellio to make wi-fi on the trains fitted with it free NOW - give us a sign that you actually mean business, and you ARE putting passengers first. I wish you, and all rail passengers in East Anglia good luck. The Pursey Clan are currently on the high seas sailing around the Baltic. One of the countries on their itinerary is Finland. Since I have never had page views from that fine country I made Mr Pursey Jnr promise me he would log in and let me tick another one off the list. Seems they are needed to as my hundreds of Russian readers have deserted me and have been replaced by 29 people avidly interested in all things transport East Anglia from Somalia no less. Just proves the phrase lies, damn lies and statistics is as true now as ever and is the main reason why I don't show my page views as they are not an accurate reflection. Anyway Finnish views duly logged I then discovered Andrew Pursey had kindly sent me a pic of a local Finnish bus on Sightseeing duties in Helsinki. Oh ha ha very funny I thought when I first saw it but take a closer look. The stairs appear to be at the front, so is this an RMA or has it been converted? No ID is obvious on the bus so your challenge is to identify this Routemaster! No prizes except you can be confirmed as an official smartass! Since the majority of this week has been devoted to dealing with disruption caused by the caring souls at the Department of Work & Pensions I've been unable to do any serious material gathering for a post so thought I'd go through some of the stories circulating this week, with some comment hopefully leading to discussion. Obviously we have to start with Anglian. If you look in the comments section of the previous post you will see that all of Go Ahead's East Anglia operators made substantial losses in the financial year 2014-15, with Anglian eclipsing them all at over £1.1m despite a healthy tax rebate that would certainly fill my freezer a few times over. Lord only knows what the next figures will show but clearly Go Ahead can't carry on as they are. So Hedingham's Tollesbury depot has been closed, Rackheath has been re-opened to reduce the cost of dead mileage to and from Dereham (and to encourage drivers based in Norwich to work for Konect), and Anglian is being stripped back to the bare bones. It is all but definite the gas buses are going to Plymouth, and this week Anglian announced that on top of 2 Versas transferring to Konect another 6 buses were being withdrawn, including 2 of the 11 reg Scania Omnilinks. Yes 2 of Konect's B7tl deckers have gone the other way, and Solo 959 has been reinstated, presumably to operate the 85's when the new tender starts at the end of the month, but that still means a net loss of 17 buses. This will mean only 18 buses left (less than Borderbus) - and the question is will that be enough? Well let's try and work that one out. 6 buses on X88/88/88A, 2 on the 87, 6 on the 61, 1 on 60H/60S, 1 on the 81, 1 on the 85 and 3 on the 83/84. There is also the one each way 7A to consider. That makes a minimum of 20 buses, and that's not taking into account maintenance and spares. Therefore one of 3 things could be happening. Firstly more buses cascaded from Konect, but why give them the Versas if that was the case. They are not on loan as they have disappeared from the fleet list. Secondly some services such as the 83/84/87 transferred to Rackheath and Konect - if there is room there which I have heard there might not be. 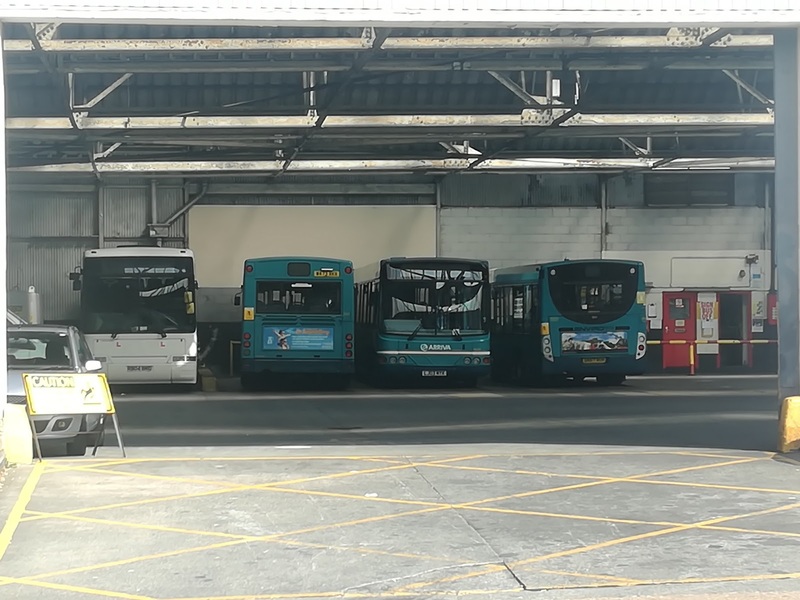 Thirdly Anglian have not had it confirmed that the gas buses are going and all of a sudden the buses withdrawn this week will be hurriedly pressed back into service, and more - even the 05 reg Scanias could make a surprise come back. However, this doesn't answer the question of why the gas buses are going in the first place. Plymouth are currently installing the required gas pumps but why are Go Ahead prepared to spend considerable money when Beccles already has them? Two theories are emerging as the most likely - firstly Anglian is on the point of closure. 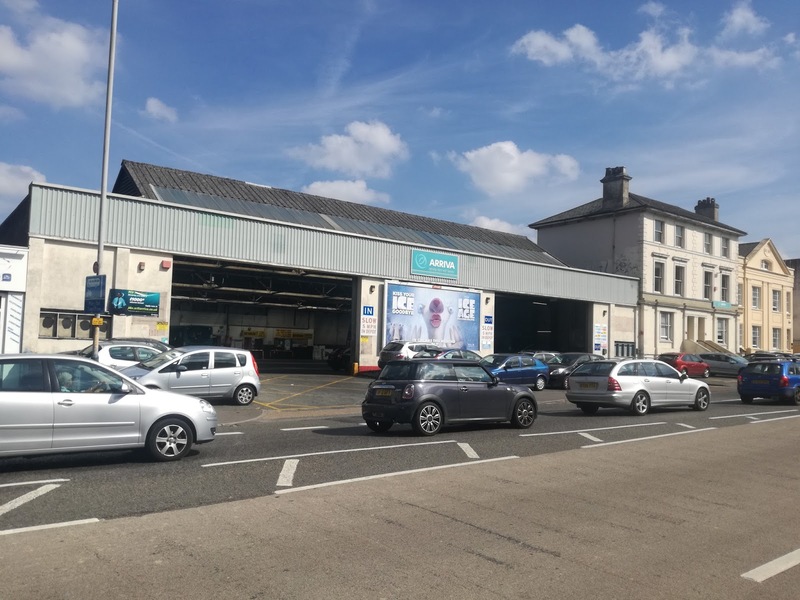 It's been on the cards for a long time now with operations and services getting smaller and smaller which means the gas buses would require a new home. Or, and I'm inclined to believe this more, Go Ahead now regard the Ellough site as too big and costly now, and are looking to relocate Anglian to smaller premises, that of course wouldn't have gas pumps. It's utterly pointless asking Anglian anything as they appear to be the last to be told what's happening, but I hope, for the sake of the loyal drivers remaining with Anglian, that the future is revealed sooner rather than later. It's the least those drivers, and the passengers deserve. Yesterday I had the pleasure of being invited to lunch with a rather special club. When Anglian operated the 165 between Aldeburgh and Ipswich a few of the regular passengers and drivers became good friends. When the route was abruptly scrapped by Phil Eden to the dismay of the users of that service the 165 Club stayed in touch, and yesterday was one of their regular get togethers. If ever there was evidence to back up my assertion that on rural routes regular passengers like regular drivers they can rely on this is it. This bus was part of the community, not just a mere means of getting into town, and if rural services are to be maintained this sense of trust, friendship and loyalty needs to be rediscovered and grown. Buses in the country need to be part of the community they serve, not just another vehicle passing through at roughly the same times every day. My thanks to Jane ( a truly dedicated reader) and John for making me feel so welcome and putting on a great lunch (those profiteroles were incredible), and to the 165 Club including Lena, Robin, Mike and Peter it was great to chat to you all and hope it's not the last time. Moving onto the rails and the industry and passengers alike are still waiting for the Anglian franchise winner to be announced. This uncertainty is not good for anyone, and no one can blame Abellio for not spending any money when they don't know if they are soon to be sacked. 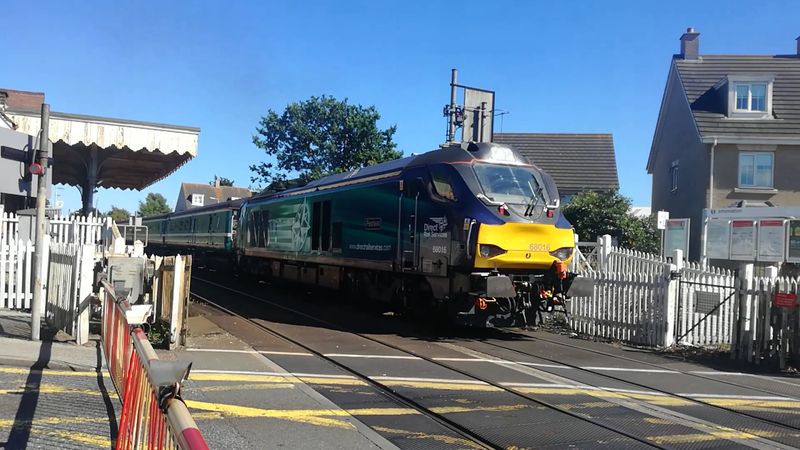 Therefore short formed and overcrowded trains are becoming more common, including a single coach train operating between Norwich and Yarmouth on a Summer Saturday in August. Bet that was pleasant. Freight trains seem to be failing left right and centre and there needs to be greater financial penalties for freight operators who delay passenger trains. That together with dedicated freight lines, of course, to give passenger trains clearer lines opening up more slots. Wonder if the Chinese want to help us do that too. Some good news this week, thanks to David Green for this, is that Soames of Otley will now no longer be closing. The business has been bought by an as yet unnamed individual and will carry on trading as usual. This is good news as far too many of our small independent operators are disappearing. More info as I receive it. Finally whispers are reaching me that First could be about to concede the biggest own goal in recent history. If it happens I'll report it, but I gather a lot of people are praying for a John Terry type last gasp clearance. Could be a fascinating week.